Habitat: Arctic, subarctic, alpine, and boreal zones such as forests, grasslands, tundra, and rocky areas (e.g. inland cliffs, mountain peaks). Range: Circumpolar: Canada, China, Estonia, Finland, Mongolia, Norway, Russian Federation, Sweden, and the United States. Estimated Population Size: Due to low density and wide distribution, estimates are extremely difficult. Combining conclusions from various recent studies, the worldwide population likely ranges between 15,000 and 30,000 individuals. Size: Resembling a small bear, the wolverine is 26 – 36 inches long, excluding its bushy, 5 – 10 inch tail; shoulder height is 14 – 17 inches, and weight is 20 – 66 pounds. Diet: Deer, sheep, small bears, rodents, hares, and other small burrowing mammals. Large portion of diet also comes from scavenged meat from carcasses of large mammals such as caribou and elk. The wolverine’s binomial name, Gulo gulo, comes from the Latin word gulo meaning glutton. It’s a fitting name; the wolverine has a voracious appetite and is known to devour even the bones and teeth of the animals it finds or kills. The wolverine can accomplish this feat thanks to its razor sharp teeth and powerful mandibles. 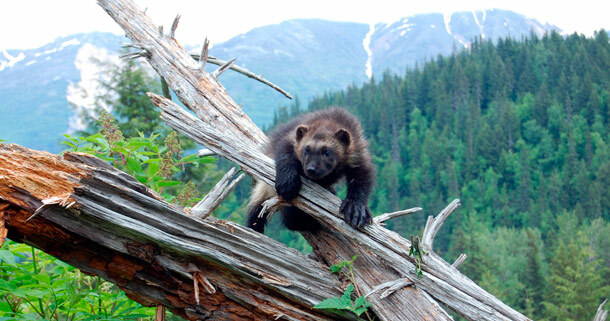 During the 19th century, wolverine populations nearly disappeared due to hunting and other human activities like deforestation and recreational use of their habitats. But over the last few decades, they have been staging a comeback—many scientists expect large populations living in Canada and the northern United States. While the wolverine is the largest species of the land-dwelling weasels, it is much smaller than many of the other mammals within its territory. However, its size belies its strength and remarkable fearlessness—there is at least one reported story of a 30 pound wolverine attempting to steal a kill from a 400 to 500 pound black bear! The wolverine’s sense of smell is uncanny—it can detect a carcass lying 20 feet under the snow, allowing it to find the remains of animals killed in avalanches. A solitary and nocturnal hunter, the wolverine spends most of the year by itself, roaming its enormous territory, which varies from 65 km in Montana, USA to over 600 km in Scandinavia. Wolverines were once thought to be entirely reclusive and anti-social, getting together only for the purpose of mating. However, new findings indicate that after infants are born, they stay with their mother for up to an entire year and the dad returns periodically to help raise the kits. It turns out wolverine dads like to show their offspring the ropes. Wolverines have an average life expectancy of 4 to 6 years, but some can reach up to 13. They come to sexual maturity around 2.5 years and mate during the spring and summer months with new litters of 1-2 infants, sometimes as many as 5, being born between February and April. Weighing only 30 pounds, the wolverine’s proportionally enormous paws act as snow shoes, allowing it to move quickly over snow covered areas. While this gives wolverines a huge advantage over their competitors, it also makes them highly vulnerable to climate change. Snow, in other words, is crucial for their survival. Wovlerine paws not only act as show shoes, but also double as claws, with the tip of each of its twenty toes curved and extremely sharp. Equipped with these hook-like extremities, the wolverine possesses what might be called natural crampons, which allow it to scale an ice fall or a sheer cliff with little difficulty. Not only do wolverines use snow to their advantage when hunting, they also build snow dens in which the kits are born and nursed. Because reproduction occurs during spring, this requires that snow cover persists well into February and March. Climate change, however, will likely bring spring temperatures earlier in certain areas, which poses another risk to the wolverine’s survival by further limiting its range. When female wolverines build their dens in late February, they dig as deep as 15 feet below the snow to protect their young from predators and the cold. In 2009, a wolverine named M56 was captured near Grand Teton National Park. Scientists tracked M56 using radio equipment and were astonished by its journey—it traveled 550 solitary miles during April and May, over highways, mountain ranges, and across state lines. M56 became the first observed wolverine in Colorado since 1919. The wolverine has a great deal of spiritual significance for Native Americans. For some, it functions as a link to the spiritual world and is understood as both a trickster and a hero. Wolverines are known for having a very strong odor. They use their pungent smell in order to mark their territory and ensure that no rival wolverines invade their range. Because wolverines are both extremely territorial and highly sensitive to disturbance, the increasing popularity of winter backcountry recreation combined with new and more powerful snow machine technologies suggests that wolverine range will continue to diminish to due human activity. Wolverines are notoriously difficult to study in the wild, which is why so little has been known about them. Scientists are only just beginning to put together an accurate picture of this marvelous creature by combining a number of research methods such as radio-tracking, remote camera surveys, live traps, and DNA traps.